The Tarot House deck is the first deck I have found via Twitter. 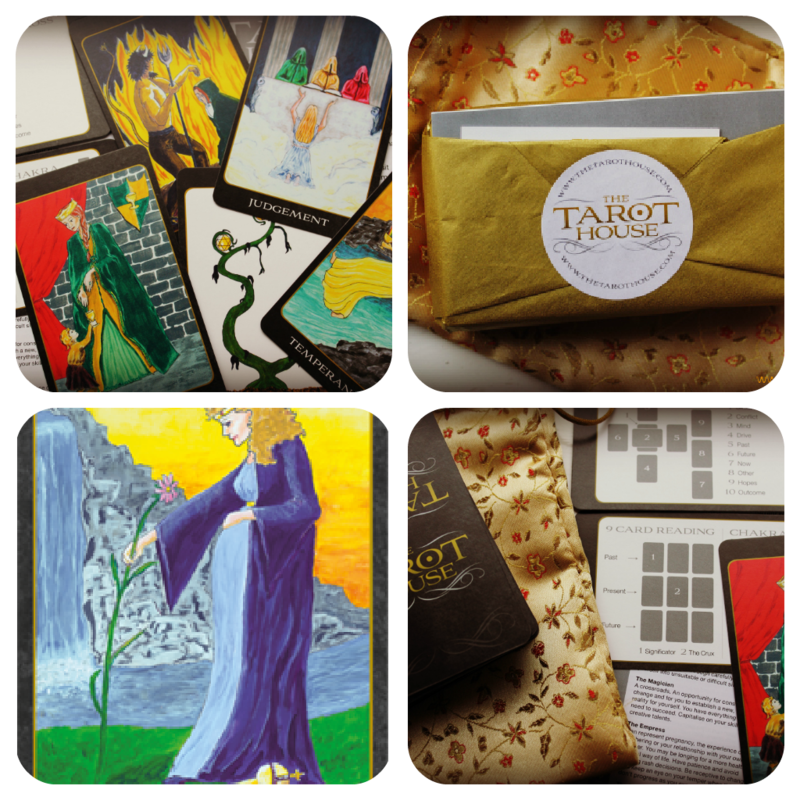 Networking online with other Tarotists, I stumbled upon the lovely Tricia House’s profile and when I realised she was a deck creator of a self-published deck I just had to check it out. Tricia co-created the Tarot House deck with her daughter, Jenny, who is a Reiki Healer and Tarot reader. You can read how the deck came about HERE. The deck comes infused with Reiki energy and feels wonderful to handle right from the start. It also comes beautifully wrapped in gold tissue paper and a beautiful complimentary bag to keep the cards in (there is no cardboard box). Also included is a leaflet with divinatory meanings and two cards with spread descriptions for the Celtic Cross, a 9 Card Spread and a Chakra Spread. More in-depth card meanings are provided on the website, where you can also see samples of individual cards. Let’s cut to the chase and see what this deck which I’m totally having a girl crush on (yes, it is definitely a ‘she’) is really all about! Me: That’s great. My greatest shortcoming is a lack of patience! Or is it wanting instant gratification? I can’t decide. Tarot House: Perhaps it is indecision? Me: Awesome! I love this card. It reminds me of three very special Spirit Guides. This card is one of the main reasons I know I had to have this deck. This will make it easier for them to communicate since I’m not yet very clairvoyant or clairaudient. 3. What gift do you bring? – 6 of Cups: I bring you the gift of friendship. Isn’t it true to say that you felt as if you were being united with a long lost friend the first time you held me in your hands? 4. What do you expect in return? – The Devil: I’m sure it didn’t escape your notice that you pulled another 6 vibration card, but one that pertains to your shadow. I expect you to deal with your remaining fears head on. It’s time to clear any blocks to love once and for all so that healing energy can flow unhindered in all your Tarot work. 5. How can you help me serve? 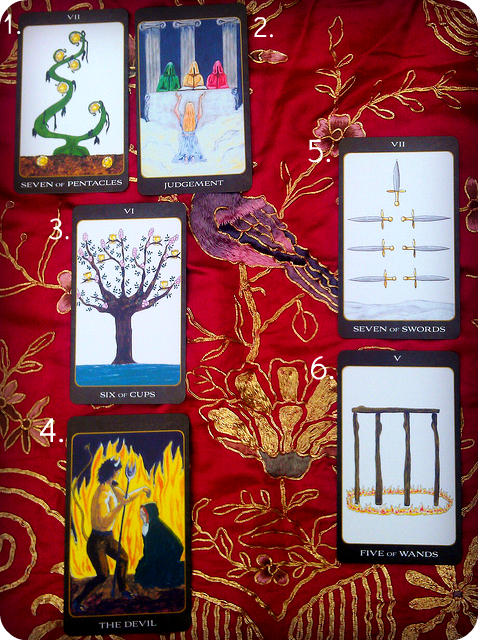 – 7 of Swords: The sparsely illustrated pips can help you to detach emotionally and analyse your readings strategically.